A nightmarish reconstruction of the Indonesian military coup of 1965, with the perpetrators playing themselves and their victims. When the government of Indonesia was overthrown by the military in 1965, more than one million people were killed in less than a year. Anwar and his friends were promoted from ticket scalpers to death squad leaders, and Anwar killed hundreds of people with his own hands. In The Act of Killing , Anwar and his friends agree to tell us the story of the killings. But their idea of being in a movie is not to provide testimony for a documentary: they want to be stars in their favourite film genres - gangster, western, musical. They write the scripts. They play themselves. And they play their victims. 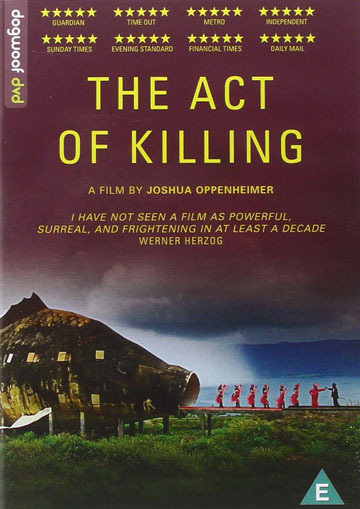 The Act of Killing is a nightmarish vision - a journey into the memories and imaginations of the unrepentant perpetrators and the shockingly banal regime of corruption and impunity they inhabit.